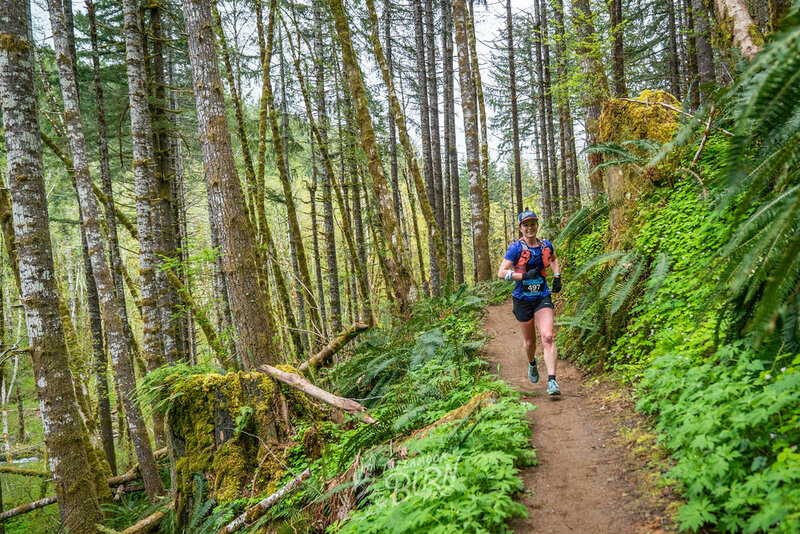 The Tillamook Burn 50K is a beautifully tough, heavily forested out-and-back course, run almost entirely on singletrack trail. The route traverses the Oregon Coast Range mountain divide from Reehers Camp to University Falls and back, involving 31.8 miles, 7000 ft. of ascent and 7000 ft. of descent. There are 5 full aid stations along the course. The trails are quite hilly with a generally soft dirt surface offering great footing, although there are some technical sections with rocks and roots, as well as some long climbs and descents. Runners will cross many small rushing streams, pass by multiple waterfalls, enjoy miles and miles of remote creekside trail and some nice territorial views. FINAL CUT OFF: 5:00PM (9 hours to finish). Click on the course map for a high resolution copy. The 50K has five aid stations and will be very well supported with enthusiastic and experienced volunteers! Be sure to express your appreciation for their support during the race. All aid stations will also have medical personnel present with a full compliment of emergency response equipment. Start to Aid Station 1 (Bell Camp): Runners depart Reehers Camp on Gales Creek Trail, cross the Nehalem River bridge then begin climbing some small rolling hills for the first 1.5 miles. This is followed by a 1450' climb in the next 2 miles up to Bell Camp Aid Station. Aid Station 1 (Bell Camp) to Aid Station 2 (Storey Burn): Runners depart Bell Camp on Gales Creek Trail and get a long, rolling descent for 6 miles on scenic creekside trail, crossing many small streams. The course then continues on Storey Burn Trail, with a rolling 900' ascent over 2 miles to Storey Burn Aid Station. Aid Station 2 (Storey Burn) to Aid Station 3 (University Falls): Leaving Storey Burn Aid Station, runners travel 2 miles on Storey Burn Trail through multiple gullies with small stream crossings and a significant descent, offering awesome views of Larch Mountain (one of the highest points in the Oregon Coast Range) and the Drift Creek canyon below. Runners then connect onto Gravelle Brothers Trail, immediately crossing over the Wilson River, then continuing on winding and rolling trail for 2 more miles to University Falls Aid Station and a roaring close-up view of University Falls, which is the turnaround and halfway point of the course. From University Falls, runners return the way they came, passing back through Storey Burn Aid Station for Aid Station 4 and Bell Camp Aid Station for Aid Station 5 on the way back to Reehers Camp for the finish. Crew and spectators are welcome at the Start/Finish area at Reehers Camp. Limited crew (no spectators) are allowed at Storey Burn Aid Station, however parking is tight and roadside parking is not allowed. Google map directions to Storey Burn Aid Station from Reehers Camp are available here. There will be no drop bags available.